As an e-Learning developer I had to invest a lot of time to find images for my e-Learning projects. I am sure that the most of us work with tight budgets and limited resources. To take a digital camera and take my own images wasn’t an option. As a result, I had to do a research and find the best FREE stock photo sites. 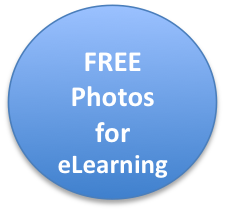 I hope that the following list of 23 (Update 06/02/2011) 14 Free Stock Photos Site for e-Learning will be valuable to you. You should be sure that the e-Learning community will very much appreciate if you write a comment with links to FREE stock photo sites. FreeImages is not just another clipart graphic site!…. more than 6000 original stock photos all for FREE! Free images is a high quality resource of digital stock photographic images for use by all. All images in their collection are free to use on websites and printed materials. At Cutcaster you can download free photos, free pictures, no cost photos and royalty free stock vector illustrations. All Our Stock is a completely free stock website. All of the content here is available to you 100% free, for both commercial and personal usage. What makes us different is that our licensing has no restrictions for your creations. You don’t have to worry about whether it’s royalty-free or not, or whether you need to attribute the creator. So long as you don’t redistribute the original file, you can download and enjoy! The SXC (stock.xhng) is a website providing free-to use stock photography and illustrations. The stock.xhng operates as a hybrid of a picture library site and a social networking site; registered users may set up a personal profile, upload their photographic works to share with other users, write a blog and participate in online forums to discuss and critique each others’ work. If you are a designer you can download high resolution RF stock images for free from Dreams Time . If you are a photographer you have the opportunity to achieve a great portfolio exposure by offering free images. The photos in the Flickr Free Use Photos Group are available for use by anyone. There is no need to give credit or to fear rights infringement. These images are posted by their creators. By posting to this group, you’re allowing freedom of use. Not just another clipart graphic site. Free Images collection now contains more than 5000 ORIGINAL stock photos in 76 Galleries all for FREE! Public Domain Image, royalty free stock photos, copyright friendly free images. Not copyrighted, no rights reserved. All pictures on this site are explicitly placed in the public domain, free for any personal or commercial use. In PhotoXpress you can get 10 free images per day by signing up. This growing collection of photos taken by USAID staff and development partners reflects some of the many facets of USAID’s work in Africa. These photos may be used for non-commercial and educational purposes only. To use a photo, you must include proper attribution to USAID and the photographer’s name, if listed. Every Stock Photo is a search engine for free photos. These come from many sources and are license-specific. You can view a photo’s license by clicking on the license icon, below and left of photos. Membership is free, without advertising, and allows you to rate, tag, collect and comment on photos. Guys, do not forget to leave a comment if you know any other FREE stock photo sites.